Bleach, Vol. 22 finds Ichigo in a bad place. Inside of him is a Hollow that can’t wait to get out. His father, Isshin Kurosaki, has reappeared and is revealed to have once been a Soul Reaper, and is again. Meanwhile, two powerful new enemies have appeared, Arrancars, a new kind of Hollow, and they want Ichigo. THE LOWDOWN: Manga-ka Tite Kubo has created in Bleach a dense multi-layered narrative housing a mob of characters. Each of those numerous characters is involved in at least two sub-plots. The reader will need a scorecard and “Spark Notes,” to keep up, but shouldn’t be put off. 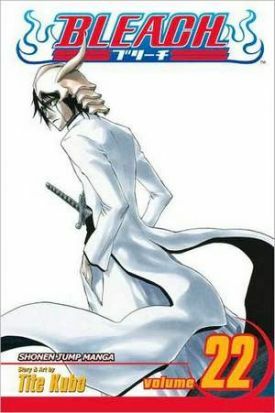 Bleach is a volatile fight comic, with each battle practically raising a mini-mushroom cloud of fiery magic and spent energy. The action here is as good as the best superhero comics. Plus, Kubo is an amazing artist. He uses sharp line work to create them and then, defines them with the kind of costumes and makeup that would earn Oscar attention were it on the silver screen. Meanwhile, Kubo’s compositions of battle scenes are nothing short of breathtaking – the kind of stuff that gets the heart pumping when it’s not stopping it. POSSIBLE AUDIENCE: Easily among the short-listed best shounen titles, Bleach is for those who want engaging characters to go with intense action.